Tigran Vartanovich Petrosian (June 17, 1929 – August 13, 1984) was a Soviet Armenian Grandmaster, and World Chess Champion from 1963 to 1969. He was nicknamed "Iron Tigran" due to his almost impenetrable defensive playing style, which emphasized safety above all else. Petrosian was a Candidate for the World Championship on eight occasions (1953, 1956, 1959, 1962, 1971, 1974, 1977 and 1980). He won the World Championship in 1963 against Mikhail Botvinnik, successfully defended it in 1966 against Boris Spassky, and lost it in 1969 to Spassky. Thus he was the defending World Champion or a World Championship Candidate in ten consecutive three-year cycles. He won the Soviet Championship four times (1959, 1961, 1969, and 1975). Petrosian is widely known for popularizing chess in Armenia. He was recognized as the hardest player to beat in the history of chess. Petrosian was not selected for the Soviet Olympiad side until 1958; he had already been a Candidate twice by that time. But he then made ten straight Soviet Olympiad teams from 1958 to 1978, won nine team gold medals, one team silver medal, and six individual gold medals. 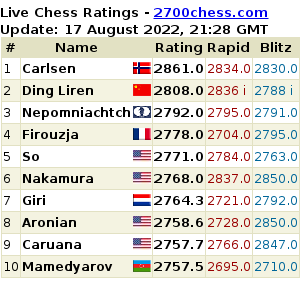 His overall performance in Olympiad play is impressive: +78 −1 =50 (only one game lost, to Robert Hübner, out of 129 played), the third all-time best performance after Mikhail Tal and Anatoly Karpov. Petrosian was an expert against the King's Indian Defence, and he often played what is now known as the Petrosian System. The Queen's Indian Defence also has a variation developed by Petrosian. This system received much attention in 1980 when it was used by the young Garry Kasparov to defeat several grandmasters. Today the Petrosian Variation is still considered the most pressing variation, with the greatest score in Master games. For his excellence in World Chess and significant contribution to the game, the Glenwood Chess Club honours his memory through the Petrosian Memorial Tournament, a one day rapid swiss on 1 June 2014. Download the tournament schedule here.